Welcome to the second installment of Marsello’s eCommerce SEO series. In our previous article, we talked about the basics of Search Engine Optimization and the initial steps you should take to kick off your efforts. This week, we’ll be discussing the costs of Search Engine Optimization and the things you can do to get more bang for your buck. A 2018 study by Ahrefs found that the most popular hourly rate for SEO professionals ranges from $101-150 per hour. For those that charge monthly retainer fees, the range of $500-$1,000 per month was the most popular pricing tier. And while those figures aren’t surprising, they’re far from being chump change, especially if you’re a small business. While your exact steps will depend on how much SEO work you need, we’ve put together some expert-backed pointers on how you can save money on search engine optimization costs. If you have some time on your hands and don’t have the budget to pay someone $100+ an hour for SEO services, then going the do-it-yourself (aka DIY) route could be a good way to go. Just remember, though, that your results from your DIY efforts will only be as good as your SEO knowledge. That’s why if you’re not well-versed in Search Engine Optimization, the first thing you should do is educate yourself. He adds that eCommerce-centric SEO is different from the average website, which is why he recommends consuming SEO resources specifically for eCommerce merchants. To start with, Alex suggests the comprehensive eCommerce SEO guides from Ahrefs, Backlinko, and Neil Patel. Guides such as these give a good grounding for the information eCommerce retailers need when getting started with SEO and it’s a great idea to get this base-understanding as early as possible. If you have funds to spare, Hanzel recommends using it on a consultant. But rather than paying an SEO specialist to work on your site for 20+ hours a month for a year, you can choose to spend a fraction of the cost by consulting with an expert who can tell you what to do. With that said, if you decide to hire a consultant or advisor, make it a point to take action on their recommendations. 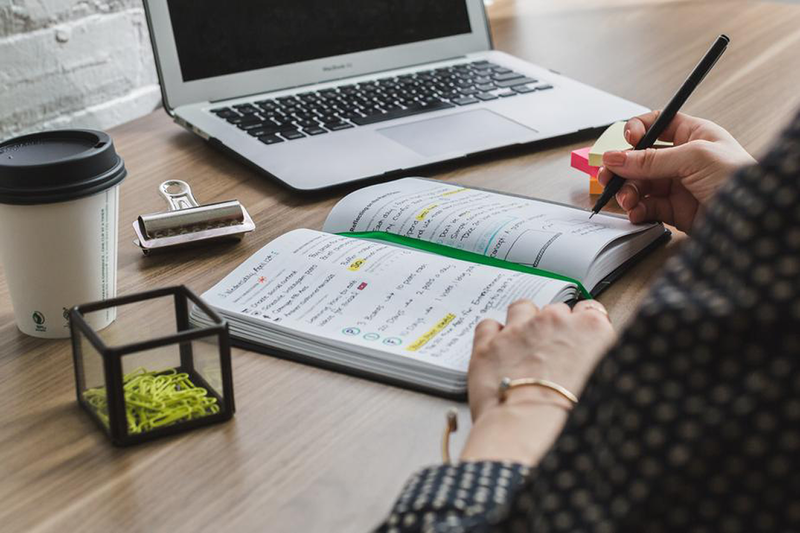 “SEO does take time, so make sure you're putting in the effort and time to fully dedicate yourself to it, and you'll reap the benefits for years,” says Hanzel. To reiterate Hanzel’s point, SEO can take months even to seem to make a difference, and even then it’s not static. You will need to update your store, information, and content frequently to be sure that it’s relevant. The basic idea is that Google and other search engines see your site, process that information as valuable to the search requests of your potential customers, and prioritizes your site in the search results. The higher your store appears in that list; the more likely a customer is to click on it and convert to purchasing with you. SEO is a long game, but it’s undeniably important. Let’s look at each of these components in more detail. As we mentioned in our previous post, keyword research is the cornerstone of any Search Engine Optimization strategy. Before getting to the ‘optimization’ part of SEO, you first need to identify the keywords that your customers are searching for. As we mentioned previously, the best keywords are the ones with a high search volume (because it means many people are searching for it) but with a competition level low enough for you to compete with. But there's another key component that makes a search term worth targeting, and that's intent. When doing your research, you need to discern whether or not a keyword is backed by a consumer's intent to buy. When identifying keywords to use in your copy, ask yourself: "does this search term reflect an intent to buy?". If the answer is no, then it's not a good keyword to target. There’s no shortage of SEO tools dedicated to keyword research. Some of the industry’s favorites include Ahrefs, SEMRush, and Mangools, though we should note that these come with a subscription fee. And since this guide is for merchants looking to save on SEO costs, we’ll be focusing on the free tools you can use to find keywords. Google’s Keyword Planner is a great starting point for search term ideas. Simply enter keywords related to your product, and the tool will make numerous suggestions based on what others are searching for. Google will also display a search volume and competition level for each keyword. 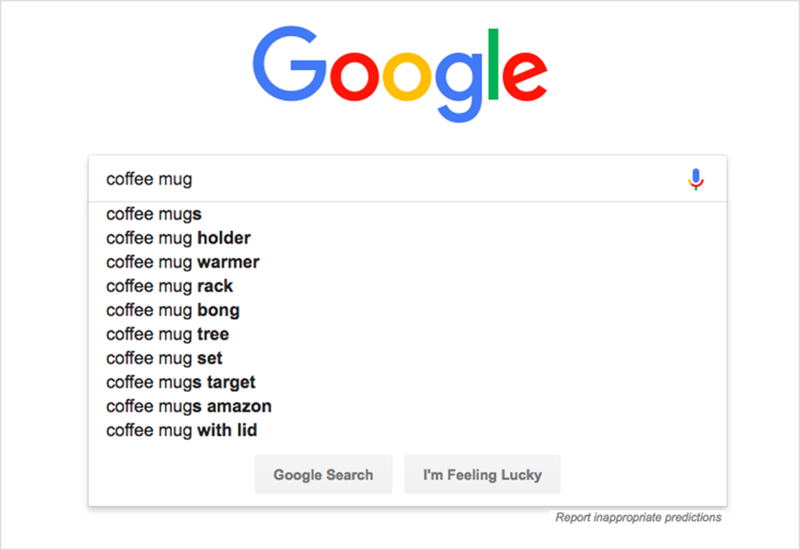 For instance, when you enter the word ‘mug’ into Google’s Keyword Planner, it’ll serve up nearly a thousand relevant ‘mug’ related keywords you can sift through. Online marketing guru Neil Patel created a nifty tool called ‘Ubersuggest’, which can be an excellent source for ideas. Much like Google Keyword Planner, Ubersuggest displays search volume estimates and competition info. Even better, Ubersuggest offers keyword difficulty insights that can estimate your chances of ranking in the top 20 search results. Another easy way to surface the right keywords is to use Amazon. Just start typing your keyword into the search box and take note of what the autocomplete feature will display. What’s great about this method is that since Amazon is already a shopping site, most (if not all of the keywords) it suggests would be high-intent search terms. Google (the search engine) also has a great autocomplete feature that you can mine for keyword ideas. Again, just type in a search term and see what the tool suggests. Do note that that with the last two suggestions (i.e., Amazon and Google) you won’t get any data on search volume and competition. That’s why if you’re using these sites for keyword ideas, you’ll need to take note of the keywords you want to target and enter them into a tool (like Google Keyword Planner) that shows you how many people are searching for the term and what the competition looks like. A great example of a website that does all of the above is Zazzle. Their website is one of the top search results for ‘funny mugs’ and for good reason. As you’ll see below, all the key areas of Zazzle’s category and product pages are optimized for search. Title tags – In addition to telling search engines what the title of a page is, the title tag is also text that shows up on search results, so it's also one of the first pieces of information that potential visitors see. In eCommerce, the best places on which to optimize your title tags are your category pages and product pages. Headers and subheaders – Headers and subheaders can have a lot of SEO value, as Google factors them in when determining if a page is relevant to a particular search term. From user's perspective, headers can act as signposts that help visitors easily skim your content or jump to the section that's relevant to them. In the world of ecommerce, your headers usually come in the form of your product titles and subtitles, so make sure they're optimized for search. Product or category descriptions – Your product and category descriptions essentially tell customers and search engines what your merchandise is all about. In addition to peppering in relevant keywords, you want to make sure your descriptions are unique. Google doesn’t like duplicate content, so using the product descriptions of your manufacturers – or worse – copying another website’s description, will lead to poor rankings. After you’ve optimized your content for SEO, the next step is to build links for your site. While no one knows for sure how Google's algorithm works, pretty much everyone agrees that links are a critical ranking factor. In short, the more high-quality links pointing to your site, the better your chances of ranking. Build relationships with bloggers in your niche and see if they can feature you on their site. An effective tactic here is to send them a free sample in exchange for an honest review. You could even assign a promo code or affiliate link that allows bloggers to earn a commission when someone buys your product through their site. For instance, when Tarashaun Hausner reviewed Daily Harvest on her blog Blender Babes, she included a special promo code that gives readers 3 free cups when they sign up. Her post also contains affiliate links, so she can earn revenue for each signup. Connecting with members of the press is another great way to obtain backlinks. Find journalists who are writing a story relevant to your industry and volunteer yourself as a source for their article. You can easily do this using a tool called HARO. Short for “Help a Reporter Out,” HARO is a service that lets journalists submit queries asking for expert input for their articles. When you subscribe to their service, HARO sends you daily queries from journalists, which you can then respond to. If the journalist likes your input, they’ll include it in their article and will often link back to your website. Here’s an example of what query looks like. The journalist sends in a description of an article that they’re writing along with a request for sources. Members subscribers receive the query in their inbox and can choose to respond if they’re a good fit for the article. Another way to gain backlinks? Produce link-worthy content. Create a piece of content (e.g., guide, video, blog etc) that’s so engaging that people would naturally want to link to it. Dollar Shave Club is a master at this strategy. The company regularly creates useful and entertaining content for its website; in addition to helping DSC engage their followers and subscribers, all that content is also helping them gain backlinks. For example, DSC’s ‘Original Content’ homepage currently has 285 backlinks, many of which are from high-quality sites. DSC is also doing well with video. The company has produced several hilarious videos about their product, which earned them backlinks from the likes of The Wall Street Journal, Vox, Entrepreneur, and more. One of their top videos currently has more than 25 million views and over 53,000 backlinks. As you can see, effectively gaining backlinks doesn’t just happen. Getting others to link to your site requires active outreach and content creation, so it’s critical to incorporate these tasks into your SEO strategy. Yoast – Yoast is a plugin made for WordPress. The free version enables you to optimize your blog posts through tools like keyword optimization and Google preview. Yoast can also check your content for readability and make on-page recommendations on how to improve. Keywords Everywhere – This is a free browser plugin for Chrome and Firefox that displays search volume, CPC, and competition data for the keywords that you search on sites like Google, Amazon, YouTube, Answer the Public, and more. LinkMiner – Another Chrome extension, LinkMiner helps surface broken on any website. Broken links can be harmful for SEO, so this tool makes it easy to find those pesky links so you can fix them. Can I Rank? – Can I Rank is an AI-powered tool that analyzes your website and gives you insights on what you can do improve? It provides insights like which pages are ranking well (and why) and you'll get suggestions for content ideas, link opportunities, and more. SERP Preview Tool – Curious about how your website will appear in search results? Portent's SERP Preview Tool can help. Just enter your title tag, meta description, and URL and the tool will generate Google search result preview for you. If you have a full plate and don’t have the capacity to fully shoulder all things SEO, consider adopting a hybrid approach where you do some tasks yourself while outsourcing others. How do you determine the right balance? Start by making a list of the SEO tasks that need to be addressed (e.g., link building, creating content, creating a site map, etc.). From there, figure out your strengths and focus your efforts on the things that you’re good at. As Catherine Giese, SEO associate at Fundera puts it, “SEO encompasses a lot of time-consuming techniques such as keyword research, site structuring, and link building. That's why it's often at least one person's job, if not that of an entire team,” she says. Follow her advice when you’re mapping out your strategy. Before diving into various SEO tasks, iron out the specific jobs that need to get done, figure out what you can do yourself, and then outsource the rest. If you decide to outsource your SEO, do your research and make sure you select a reputable agency or freelancer who can optimize your site using ethical and white hat tactics. One of the best ways to go is to ask for referrals from merchants you know that are ranking well on Google. Then once you have a handful of prospects, request for case studies and references so you can see the results they’ve achieved with other businesses. In terms of working arrangements, we recommend avoiding long-term contracts, as the last thing you want is to be tied down to an agency or freelancer who isn’t a good fit. Once you know who you want to work with, be smart about the tasks you assign to the agency or freelancer. You want to make sure you get the most value out of their efforts, so figure out the best use of their time and resources. Enoch adds that you can lower your costs even more by taking care of content yourself. While search engine optimization requires an investment (in both time and money), you can lower your costs significantly by being smart about the tasks you take on and the SEO experts that you hire. With the right SEO education, some patience, and competent experts on your side, it’s totally possible to take your SEO game to the next level. Have you seen the rest of the SEO Series? Check out Part One and Part Three in the links below.